The University of Maryland's student-run robotics team, Robotics @ Maryland, took fourth place and was awarded a $1,000 prize in this year’s 16th International RoboSub Competition, which was held July 22-28 at the Transducer Evaluation Center (TRANSDEC) Pool in San Diego, Calif. 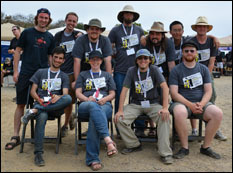 The International Robosub Competition, co-sponsored by the U.S. Office of Naval Research (ONR) and the Association for Unmanned Vehicle Systems International (AUVSI) Foundation, requires teams to build Autonomous Underwater Vehicles (AUVs), which must complete a variety of tasks to score points. Examples of tasks include following a visually marked path, navigating an obstacle course, and carrying objects. The Robotics @ Maryland team designed and built this year’s robot, Tortuga IV, an AUV with multiple sensors that can record information about itself and its environment. These sensors include a depth gauge, passive sonar (hydrophones), active sonar (Doppler Velocity Log), multiple accelerometers and gyroscopes, a forward facing camera, and a downward facing camera. Tortuga IV is also equipped with six thrusters that allow it to move and rotate around all three of its axes and has two Toypedo launchers and two marker droppers to complete competition tasks. In order to complete the project, the team organized into five different subteams, which each worked on a different component of the robot or team management. These components include mechanics, electronics, software, controls, and business, and allowed students from a variety of disciplines and interests to work together to achieve their goals. Robotics @ Maryland has placed in the top six at the International RoboSub Competition a total of five times and took first place in 2008. The Robotics @ Maryland team includes Chris Carlsen, Donald Gregorich, Julian Hylton, Justin Kanga, Nicholas Limparis, Johnny Mao, Leslie Pang, Josh Pugh, Eliot Rudnick-Cohen, Rajath Shetty, Nicholas Arnold-Medabalimi, Kate McBryan, and Stephen Christian. For more information on Robotics @ Maryland, please visit http://ram.umd.edu.